The cost of living in New York City hasn’t left me with the most robust food budget. Combine this with my schedule, which often has me home from work at 10PM, and it’s an understatement to say I have been gravitating towards easy and cheap meals (hello, pasta!). Somehow I think I am eating more like a college student now that I have graduated college. But, I must do better! It turns out that acorn squash is really cheap and healthy, so this recipe was born, bringing a bit of color into the greyest weeks I’ve witnessed so far in Brooklyn. 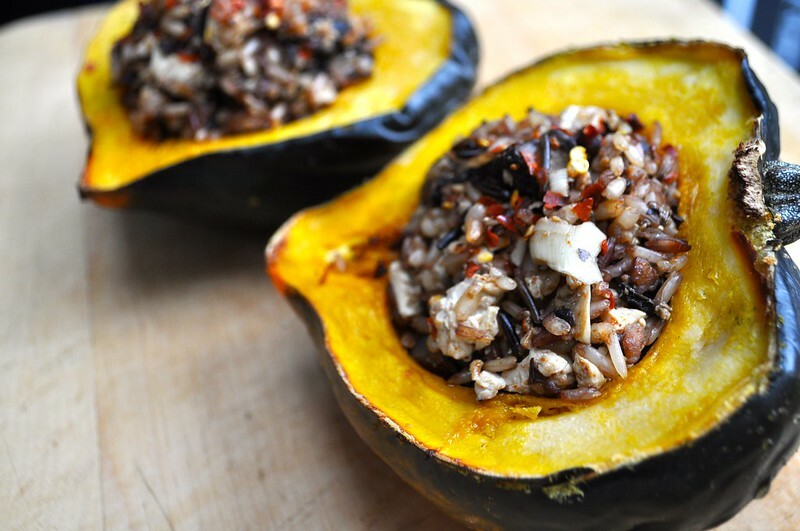 Acorn squash is rich and earthy, wild rice is chewy and flavorful, portobellos are juicy, silken tofu is creamy, and Berbere is, hands down, my favorite spice blend ever. The result is a lavish and filling dish that goes easy on your wallet…alway a plus in NYC! Note: Berbere is a wonderful Ethiopian spice blend that I recommend making from scratch from bulk spices, but you can also buy it on Amazon. Preheat oven to 350 F. Cover a baking sheet with parchment paper. Rinse the acorn squash and place it in the oven (yes, uncut) for 15 minutes. This softens it up, making it much easier to slice. Cook the wild rice blend following package instructions. Mine were: bring 1 3/4 cup of water to boil in a pot, add the cup of wild rice and reduce to low heat, cooking for 30-40 minutes. 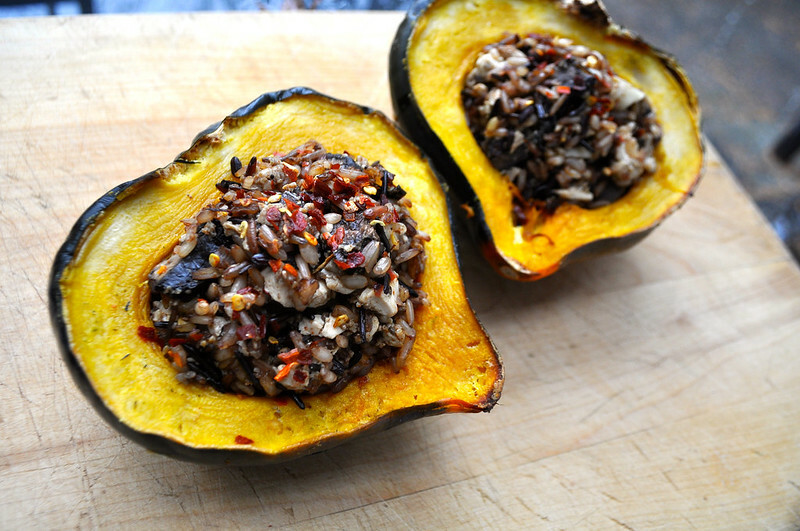 Take the acorn squash out of the oven and use a serrated knife to cut it in half. Scoop out the seeds (save for roasting! So yummy!). Brush the inside of the squash lightly with olive oil, and then put back in the oven to roast while the rice cooks (30-40 minutes), or until a fork easily pierces the squash. Heat a teaspoon of olive oil in a pan on medium heat. Open the package of silken tofu and drain the water out. Crumble the tofu into the skillet. Add the diced portobello, minced garlic, nutritional yeast, and Berbere spice to the tofu. Simmer until the rice is finished, stirring occasionally. When the rice is done, take it off the heat and add the tofu mixture, including the mushroom juices that are in the skillet. Stir, add the crushed pepper, and leave uncovered. Take the squash out of the oven and do the fork test. If the fork pierces through easily, use a spoon to scoop out about a quarter cup of squash from each half. Mixed the scooped out squash into the rice, chopping it up roughly into small chunks with the spoon. Salt the rice to taste. Spoon the rice into the squash, evenly dividing it among the squash halves. Put the stuffed squash back in the oven and bake for 15-20 more minutes, checking to occasionally to make sure it isn’t burning. And that’s it! Isn’t it beautiful? This entry was posted in entree, Uncategorized and tagged acorn squash, berbere, ethiopian, recipe, rice, squash, stuffed acorn squash, stuffed squash, tofu, vegan, vegetarian, veggie burger, wild rice. Bookmark the permalink. Hi Natasha! I should have put a note in the recipe (will add one now! ), but Berbere is a classic Ethiopian spice blend. I usually like to make my own, but I picked up a bottle of it recently at Whole Foods. Here is a recipe for it: http://www.epicurious.com/recipes/food/views/Ethiopian-Spice-Mix-Berbere-104015, or you can buy it on Amazon: http://www.amazon.com/s/ref=nb_sb_noss_1?url=search-alias%3Dgrocery&field-keywords=berbere&sprefix=berbe%2Cgrocery&rh=i%3Agrocery%2Ck%3Aberbere. It’s so delicious! If you have ever had Ethiopian food, you have tasted it. Definitely my favorite spice mix. That looks amazing. I am going to make it. I declare so right here and now. Do it!! I plan to put another acorn squash recipe up soon too :). I made this recipe tonight and really enjoyed it. I have a lot of stuffing leftover — any ideas what to do with it? Thanks! Hi Cara! I am so happy you enjoyed the recipe!! Maybe our acorn squashes were different sizes =P. You could always use the rice to stuff something else…a bell pepper, a portobello…or you could add a can of black beans and dice up a couple of tomatoes, cook them lightly, and throw them in there to just make a good messy rice to eat on its own. I’ll try to put this to good use imdmliateey.